Take a quick search on google for “Drilleys bag,” and you’ll find a lot of sites offering more or less the same bag. Some proudly proclaim it’s the same bag from the Korean cult classic Weightlifting Fairy Kim Bok-Joo. But there’s only one real Drilleys brand, and an authentic Drilleys bag trumps a copy any day. It’s actually true, that a real Drilleys eco bag – even two! – appeared on Weightlifting Fairy. But the fake copy on sale is not that one. The real deal – Drilleys in action on Weightlifting Fairy Kim Bok-Joo. Sure, imitation is the highest form of flattery. Knock-off bags are a time-honored tradition, after all! If there is a bag worth copying, then there is a copy somewhere. However, everyone knows that a knockoff is never quite as good as the original. One might think that an eco bag is not that hard to duplicate; after all, it’s just canvas, right? But actually, a Drilleys bag is more than a haphazard collection of canvas. It’s the quality of the canvas, the design, the dimensions, all put together. Lose one element, and you lose the overall look and quality. The canvas is a big factor of the authentic Drilleys. It’s not just thick canvas, and it’s not just canvas. The brand uses the same industrial canvas most often seen in laundry trucks at hotels. While it may sound less than glamorous, the cream color and strength is unique. When it blends with the design and colorful logo, it has a certain charm that’s very hard to duplicate. A knock-off might get you to “almost” as cool as the original. You’ll find something “almost” like the bag in Weightlifting Fairy. But why bother with almost, and go for the real deal? Head over to www.drilleys.com today and order your own authentic Drilleys bag. Take it from us – it’s worth it! 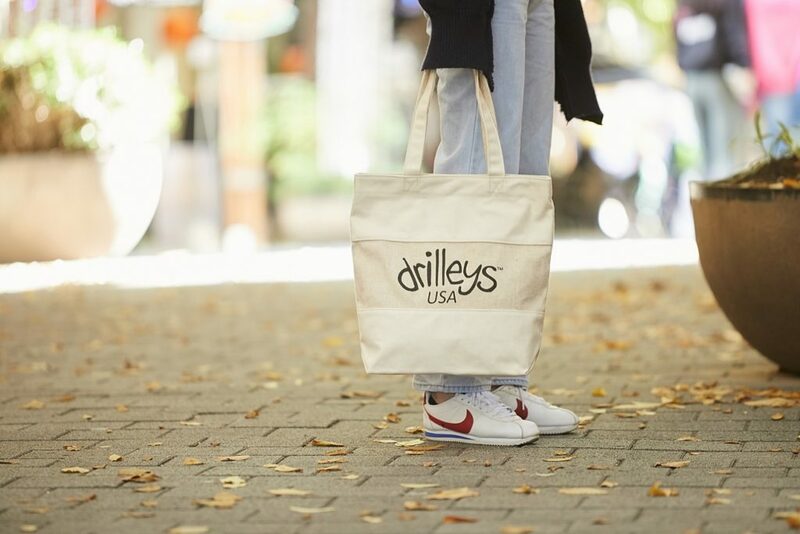 Share the post "Take Home An Authentic Drilleys Bag"
Posted in Blog and tagged authentic drilleys, drilleys bag, eco bag, eco canvas bag, eco canvas tote, weightlifting fairy kim bok joo. Bookmark the permalink.